There was an animated cartoon on TV. One of the scenes showed a huge cactus suddenly transformed into a flowering phenomenon. I never forgot how, within seconds, all the buds emerged and turned into colorful, open flowers. This scene must have photographed in slow motion and was shown in fast motion. At our home, we have beautiful plants of followers. One of the plants is “Bramha Kamal”. There are different opinions about this species. 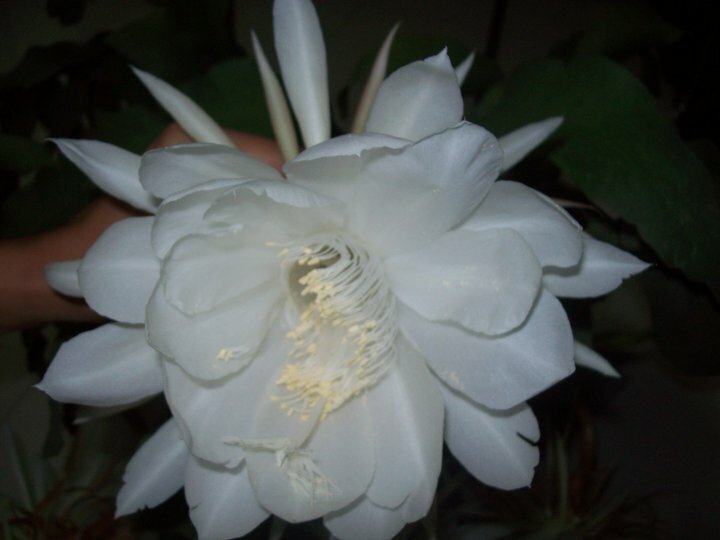 Though this is widely known as “Bramaha Kamal”, few people claim that actually it is a type of cactus. This plant is not beautiful, with stem leaves. It blossoms only for a day, with beautiful and nice fragrance. When buds comes, we try to catch the moment when a flower opens and it petals start to bloom. We always miss that, and all off sudden we see a big and beautiful follower. However for me, it symbolizes how quickly something that represents rigidity and pain can be transformed into beauty. The same thing happens with human transformation. You can never find out the exact event when it occurs. You might remember what happened before or after it, but never the moment of transformation itself. Sometimes, somebody directly appreciates you about your changed behaviour and personality which you may not have noticed. We may have spent lot of time and efforts on our transformation, but it revels all of sudden. As it happens in the NOW we can never track it down. Therefore it is magic. Contrary to change, transformation is easy; as there is no effort involved; it just happens. Like the tree letting go of the dry leaf or the fruit ripening without struggle. When you look different, you see what is already there, which you haven’t seen before. It is, therefore, effortless. Transformation is a process, but it is effortless process. But you need actually to live the transformation like the flower blossoms from buds. Transformation can be small or big. Small learning also can be transformation. When child starts walking, this is also a transformation for him and for his parents. It has impact on their lives. Our life journey is also a transformation. We become learned, Wise, mature over a period of time. We learn from mistakes and even from others’ mistakes. Human life is with lot of transformations and transformations should be accepted and celebrated time to time. But the question is do we allow ourselves to transform?